About 22 years ago, Ithaca-based band Donna the Buffalo and some of their friends saw a void in their community. AIDS was a new and deadly disease and people were uneducated about it and how to prevent it. As artists do, they decided to use their art to spread the word and make a difference – they created a festival. In the summer of 1991, The Finger Lakes GrassRoots Festival was held on the fairgrounds on the edge of the small town of Trumansburg, NY. Folks danced, listened to great music, created and witnessed art, met up with old friends, found new ones, and shared ideas. The festival was a hit, and the profits went to AIDSwork of Tompkins County to help spread the word about the terrible, yet preventable, disease. Since then, the not-for-profit festival in NY has grown continuously and has given funding to socially and environmentally responsible organizations including: Doctors Without Borders, Musicians For World Harmony, Ithaca Free Clinic, Ithaca Ballet, Hospicare of Tompkins County, Boy Scouts Of America, LACS Katrina Relief Group and more. Not just another music festival, GrassRoots became synonymous with not only being the region’s premiere music event but a community that cares about each other and the world around them and are passionate about music and culture in a very human way. The acts on the bill have not always been pop-darlings or the coolest “hit” of the year, they are artists with a conscience, who have something to give the audience that lasts longer than the moment in which songs are heard. Featured genres include: World, Roots Rock, Americana, Bluegrass, Latin, Old-time, Zydeco, Cajun, Blues, Folk, Country, Hip Hop and Jazz. World music heroes like Africa’s Hugh Massekela, Oliver Mtukudzi, Seun Kuti (accompanied by his father Fela’s band Egypt 80), and Tinariwen; Reggae pioneers like Burning Spear and Toots & The Maytals; Hip Hop social activists Arrested Development; Folk and Country greats Merle Haggard, Lucinda Williams, and Old Crow Medicine Show; Latin artists Maraca Y Otra Vision and Sierra Maestra, Native Americans Keith Secola and Deer Clan Singers; and others The Dirty Dozen Brass Band, Ani DiFranco and Rickie Lee Jones all have graced the GrassRoots Festival stages. Artists that make a difference, that educate and feed the soul. In 2003 a group of organizers from the New York festival, including GrassRoots Festival Organization founder Jordan Puryear, decided that they had such a great thing going, they should share it with as many people as possible. With a vision for a GrassRoots for every season the organization moved south to central North Carolina. The region is well known for its music, from its history of Old-time, Bluegrass, and Folk music to a thriving indie college scene; here was a perfect atmosphere in which to create another GrassRoots Festival. They discovered a 75-acre old farmstead outside of Chapel Hill and on Earth Day weekend of April 2003, the Shakori Hills GrassRoots Festival of Music & Dance was born. Four days of music, dance and art in a green, idyllic setting. There are four stages, including two in large outdoor fields, a more intimate cabaret tent and a large, 10,000 square foot dance tent. Some of the artists who have performed at Shakori Hills include: Carolina Chocolate Drops, The Avett Brothers, Bela Fleck & The Flecktones, Oliver Mtukudzi, Sharon Jones & The Dap Kings, Sam Bush, Rusted Root, Nickel Creek, Richie Havens, Ralph Stanley, Squirrel Nut Zippers and Nnenna Freelon. As with the New York festival, there is a Healing Arts area with Yoga, Tai-chi, massage and movement workshops. At Shakori Hills there is also a “Sustainability Fair” where area pioneers in Earth friendly technologies and practices come to share and present their ideas. “Attendees can camp out and stay for all four days or just come in for an afternoon. Everyone finds something here that they are interested in. They may come for a favorite band and find they have a new love of Zydeco dancing or an interest in gardening or biodiesel,” Waters recounts. Like it’s big sisters, the Virginia Key GrassRoots Festival has adapted to the local culture, celebrating it and learning from it. The festival organization has spent time not only planning a festival, but becoming familiar with the local community, finding out what the festival can bring to the table that might be missing or underestimated locally. The GrassRoots festivals not only add to their surroundings, but they strive to make it so the event becomes a place for the local community to celebrate itself, unite in understanding as well as in fun. The first Virginia Key GrassRoots Festival featured among others: Chaka Khan, Del McCoury, Arrested Development, Suenalo, Locos Por Juana, Keith Frank & His Soileau Zydeco Band, Jahfe and Donna The Buffalo. The world-renowned GrassRoots Festival of Music & Dance is coming to The Historic Virginia Key Beach Park in Miami on February 9th-12th, 2012. Founded in upstate New York in 1991, the non-profit festival showcases top tier world and roots music performers from a wide variety of genres; Latin, Reggae, Hip-Hop, Americana, Funk, Cajun, Bluegrass, Indie Rock, African, Kompa, World Beat, and Jam. International and Grammy Award winning artists will perform alongside some of Florida’s premier bands – Chaka Khan, Del McCoury, and Arrested Development. Throughout the four-day, family-friendly event, a Kid’s Village will offer interactive activities. Local artisans and visiting craftspeople will display and sell their work. In addition, celebrity dance instructors will provide ongoing group instruction and festival performers will conduct daily music and instrumental workshops. Those interested in wellness will find movement classes, flow workshops, massage and more in The Healing Arts Area. The festival welcomes local residents and out of town visitors. The on-site campgrounds, just a short walk from the beach, are open to all festival attendees for a reasonable fee. Space is for tents and vehicle camping. Day Tickets, Discounted 4-Day Passes, and Special Packages are available by phone (786) 332-4630, online www.virginiakeygrassroots.org, and at the gate. The Virginia Key GrassRoots Festival’s mission is to promote community engagement through music and arts education, while supporting environmental sustainability, and social justice. To this end, GrassRoots invites local non-profit groups to set up booths in the Community Advocacy Area. 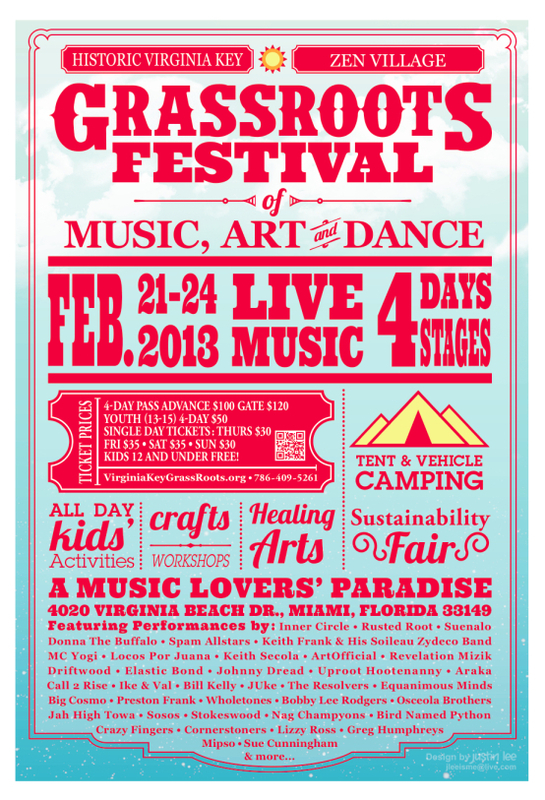 For more information please contact Emma Hewitt at emma@grassrootsfest.org or (786) 332-4630.